There are many options for authentication when SSH‘ing into a machine. The most common (and least secure) is simple password authentication. You can make this secure(ish) if you can guarantee that your users are going to use non-trivial unique phrases, from machines free of keyloggers; easier said than done. A better method is to require key based auth. If you do that, you need to guarantee that your users secure their keys and password protect them, again with non-trivial unique passphrases. I’m going to talk about a third option, which is to use smart cards. 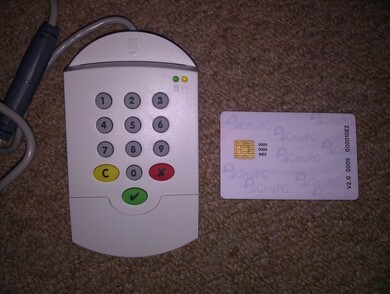 An OpenPGP Version 2 Smart Card, which I purchased for approximately £15 from Kernel Concepts. And an SCM SPR-532 USB Smart Card Reader, which I purchased for approximately £30 from PremOne Computers Ltd. I plug the USB smart card reader into my Windows 7 desktop at work. My Ubuntu Thinkpad laptop has a built in smart card reader. Once you’ve reached this point, the private part of your ssh/authentication key exists only on the smart card and can not be read by you or anyone else. A stub referencing the subkey is left behind with your on disk keypair. Whenever you try to use that subkey, the system will request that you insert the smart card. You should see that the key you generated previously is mentioned (only when the smart card is inserted). And now you’re done. If you ssh in to a machine which has your public key, you will not be prompted for your password. Instead, you will be asked to type in your pin on the smart card readers pin pad. The pin pad of my USB smart card reader makes a loud beep noise each time you press a button. This is not ideal in some scenarios so in these cases I use the keyboard instead. This is possible by adding “disable-keypad” to ~/.gnupg/scdaemon.conf. If your client machine is running Windows and you’re using Putty, there is a drop in replacement for “pageant” at http://smartcard-auth.de/ssh-en.html which does the same authentication task that gpg-agent provides in the Linux environment. Putty by default attempts to authenticate using “pageant” if it’s available, so as long as you make sure it’s running, and as long as your Windows gpg installation has a keypair with the subkey stub, it will just work. When putty prompts you to enter your pin, it gives you the option of using the hardware pin pad, or typing it in at the keyboard. If a machine is compromised, the attacker could potentially hijack SSH connections whilst you’re using them. If your keys are on a smart card, that’s all they can do. If they’re on disk (even if they’re password protected), the attacker can steal them and use them at will from any machine at any time. If you’re giving somebody else SSH access to a machine with standard key authentication, they could strip the password from the key for convenience or use an insecure password to protect it. They could leak the key, eg by using unencrypted backups or copying it to an easily lost USB stick. If you give them a smart card with a pre-generated key, then they wont be able to leak their key in this manner. I didn’t buy my smart card so I could use it with SSH. I purchased it mainly so I could use it for signing and encrypting email. The SSH capability is a bonus side effect. With the smart card reader plugged in to my work machine, it means I can safely sign my work email without exposing my secret keys or smart card pin to the work machine.